There are lots of frugal communities on the internet. There are discussion boards, groups, blogs, tweets and websites. There is nothing wrong with frugality, but one of the themes that I see is poor people remaining the working poor because of frugality and I find this very sad. I’ll illustrate by telling you about my sister in law. She and her husband don’t have a lot of money. They both work hard and are outstanding people, but their jobs are never going to make them millionaires. They have a largish house with a mega mortgage and two young daughters with lots of hobbies and interests. Consequently they have developed an amazing ability to find the greatest deal imaginable. In fact they are so good that if I ever need to buy something I will get them to source it for me and mostly I will get an unbelievable deal. Nothing, except that they have absolutely no savings and they are not making any progress with their mortgage. Everything that they buy is the cheapest version available and that doesn’t mean the quality is always so good. They find such good deals that they buy stuff they never use. To them the deal is so good that they need to make the buy rather than leaving money in the bank. Together they are so effective at finding specials that they can easily spend their entire income every period. That’s the wrong goal though right? Our family takes option 3 and gets creative to solve the problem without buying something (often we can). Their family goes for option 2 even when they don’t need the thing that they are getting a deal on. Also the stuff they buy isn’t very good quality. If I am going to buy something I am happy to part with money to get the absolute lightest, strongest, most functional and best item (option 1). I want to buy it now and use it for the rest of my life. If I can get a deal like that I am happy to pay $400 as opposed to the $12 item that will break in a year. That said I mostly don’t buy anything. Option 3 baby! Unfortunately, I see a lot of frugal people out there that are like my sister in law. 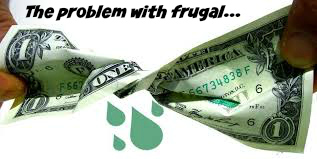 They are frugal because they want to have more money, but without a saving/investing habit they are always going to be terrible with their money no matter how much they ramp up frugal in their lifestyle. Worse, a lot of these frugal guru’s are really just spammy internet marketer types that make their living spamming channels with affiliate links that they are paid. There can be a gigantic chasm between being frugal and being a saver. Don’t let a frugal focus distract you. Saving is King, Queen, Prince and Princess! I couldn’t agree more. We just made a large purchase for a new set of living room furniture. The last set we purchased was 13 years ago. I saved to make sure that it could be purchased with cash and wouldn’t hurt our current savings plan. We intend on having this set for life if it is possible.